This letter of invent is to provide written indication of my interest in purchasing Green Party voter registration voter file from the County Registrar, with which to gather nomination signatures to qualify for consideration to appointment to a County Council vacancy (under the process described in GPLAC Bylaws Article 8 County Council Vacancies. I confirm that I am a Green Party member in Los Angeles County as of the date of this request, and that I intend to remain so throughout the signature-gathering period and consideration of my appointment by the County Council. I also understand that use of the voter file is constrained by state law. 2-3.2 Upon receipt of a letter of intent as described in 2-3.1, the GPLAC Co-coordinators shall send the following in writing to the Los Angeles County Registrar's office, language along the following lines would be acceptable to their office to allow such lists to be purchased; while at the same time preserving the GPLAC's impartiality in terms of making the data available to individual Greens, and requiring the individual purchasing the list to sign the document at the Registrar's office, creating a public record of their commitment to follow the legal uses of the information obtained. The following letter template is being circulated for a GPLAC on-line vote to be approved and added to the GPLAC Rules and Procdures, and is placed before the County Council for discussion before the on-line vote will be held. Under Green Party of Los Angeles County (GPLAC) Bylaws http://losangeles.cagreens.org/bylaws/2017-03-12#ARTICLE8, the GPLAC County Council may fill County Council vacancies by appointment. To qualify for appointment, one must gather the same number of nomination signatures from registered Greens in the State Senate district, as would have been needed to qualify for the primary election ballot in presidential years, when the County Council is regularly elected. In those regular elections, interested Green Party members may legally purchase the list of registered Greens in their State Senate District, in order to solicit nomination signatures. In so doing, they also sign a form committing to follow all applicable laws governing the use of such lists. The GPLAC supports a parallel process for Greens seeking appointment to County Council vacancies; where the GPLAC receives such a request from the interested member, their Green Party registration is verified and the GPLAC send notice to the County Registar. This is such notice. In this notice, the GPLAC states that the following individual __________ of the following address ________ in Los Angeles County, has indicated their intent in writing to the GPLAC to seek nomination signatures to qualify for appointment to the GPLAC County Council; and that they understand that they will be legally constrained by state law on how they can use the list. This person's Green Party registration was verified at the time of receipt of their interest. 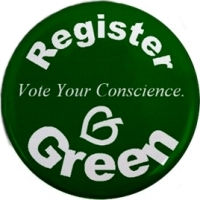 If they are still continually registered Green at the time of their application to the County Registrar's Office, they shall be considered to have met the eligiblity threshold to purchase a list from the County Registrar (similar to the process available during the regular ballot qualification period for the regular County Council elections every four years in the presidential primary). Access to the data base shall be at the discretion of the County Council and in keeping with the GPCA's IT Protocol. Individual County Councilmembers shall have no special access to the data base, other than that provided for in these Rules and Procedures, nor shall the data base be exported to nor shared with any candidate, campaign, group or individual, other than may be necessary for maintenance and upkeep by the Green Party of California and/or the Green Party of Los Angeles County. 8-1.4 Provide opportunities for interaction and involvement in the GPLAC, as well as with GPCA, GPUS and international Green Party events and opportunities open to GPLAC members. This [page, group] is for members and supporters of the Green Party of Los Angeles County, with a focus on candidates, officeholders, issues and organizing of the Green Party of Los Angeles County./Este [pagina, grupo] es para los miembros y simpatizantes del Partido Verde del Condado de Los Ángeles, con un enfoque sobre los candidatos, los funcionarios, los temas y la organización del Partido Verde del Condado de Los Angeles. Participants in this group are politely asked to follow these guidelines when posting to this group./Los participantes de este grupo se les pide amablemente que siga estas directrices cuando envío mensajes a este grupo." 8-2.2 The County Council shall appoint administrators for the official GPCA social networking pages, whose responsibility shall be to post content in keeping with 8-1 and otherwise administer the pages in keeping with 8-1. The administrators shall make periodic reports to the County Coucnil and shall follow committee decisions regarding their work.